From a Flood to a Trickle. I have to apologize to followers new and old for the gaps in posting. I have been writing, but the minimal time I’ve had available of late has forced me to choose between working on the new novel or talking about the old novel. I have chosen the former. Sales of Tempt the Ocean continue at a slow pace (very slow), but do continue. I confess I was thrilled when the earnings broke the two-digit milestone. Disheartening when compared to self–published authors who claim to make a living off their novels. I don’t know how they do it. I have to remind myself that it’s a mistake to compare my own progress to that of others. One piece of advice I have: order a small number of printed copies to keep on hand. I never ordered a set of copies of my book to distribute by hand and that has been a mistake. I have since had people ask to buy a copy of my novel outright and have not been able to provide one. A colleague mentioned a book store in our neighbourhood that highlights local independent authors by selling copies directly, but again, I have none to sell. And when I had an opportunity to product-place my novel on screen this summer I had to pass it by since I did not have any copies to loan. I have no news about making Tempt the Ocean available on other platforms outside Amazon. I can say, however, that I managed to write a good 1400 words on labour day last week, and I’m plowing through a borrowed copy of A Storm of Swords so I can return it to the library in time. If I don’t have time to write at least I can read and post the occasional Tweet. After seeing the catch phrase “blog tour” many times, I figured I should find out what the term meant, since “blog touring” has been a heavily touted avenue for successful independent book promotion. I did some digging and discovered that Blog Touring is not what I thought. I thought a blog tour meant roaming around the super highway searching out book readers (in my specific case, Romance readers). In effect, a search for blogs is part of a tour, but nailing that list of romance blogs happens long before the “Blog Tour” ever launches. The aim of an efficient Blog Tour is the same as any mass promotion: hit the target market with as many instances of the new product as possible, making it familiar—and therefore friendly—and ultimately, desirable. If something is everywhere, it must be good. The key proponent of a Blog Tour is to line up a number of book reviews and author interviews, or any other vehicle for author/book visibility like guest posts, such that all of those posts occur within a limited time frame. Each of those posts are blasting readers with the well-designed book cover you chose, so that when they see the cover for the third or fifth time they will click on the link to your purchase page and buy the book. A blog tour is a virtual book tour. There are now exclusive blog tour companies who will organize the above, who have done the legwork and made the connections with the reviewers. They also charge plenty for the opportunity. For most start-up indie authors on a limited budget, paying someone else to set up a blog tour is out of the question. This is precisely why there is plenty of sage advice about establishing connections and drumming up interest before publishing occurs. The shiny new novelty of blog touring has lost its sheen of late, likely due to the above, not to mention the huge number of self-published authors slamming small-time book bloggers with their wares. I don’t blame bloggers for taking a bit of cash in exchange for reviewing and promoting. However, I’m not a publisher and I don’t have the means. I’ve missed the boat on blog touring for the first book (and for those twelve people out there who have read it… pun intended). However, I have every motivation to seek out readers by requesting reviews wherever I can, even with the publishing date behind me. My tour will be slow and therefore more of a fizzle than a blast. In the meantime, I’m enjoying the process of seeking out Romance readers, something I should be doing regardless. I have begun the long process of review requests, and should I be lucky enough to have my novel reviewed I will either link or re-post the review here. If anyone reading this has a decent following and wants to review, let me know. Next week I won’t be posting as I am going away for the Easter weekend. Save the Date: Tempt the Ocean will be free for Kindle readers to download on March 31st . Read and Review the book! Now that Tempt the Ocean is a published book, who will to read it? For an author whose superpower is invisibility, marketing a new book that no one has heard about proves a serious challenge. I could panic, but all solid wisdom suggests that building a following takes time. There is no shortcut (short of pre-established fame). Hence, the only answer is to find a way to enjoy the building process, and embrace the adage of journey over destination. Branding and social media are huge concepts that can’t be conquered overnight. However, I thought I would present a short whirlwind tour of where I have set foot on the information superhighway—aka the tubular express—as a map to others, and talk a little about how I am using those sites to spread the word. Some of the sites are still works in progress, so bear with me. All of the sites either come up frequently in marketing discussions or have been recommended by other authors. All of them offer some variation of cross-pollination. If you are reading this post you are probably familiar with WordPress. There are other great blogging sites as well, but WordPress is where I started and where I’m comfortable. I use my WordPress Blog as my official site. My biggest challenge is to post regularly and consistently, at which I am not always successful. I am now adding two dedicated author pages to my site, one for each of my writing identities. Since publishing, I have added visibility by including a direct link at the top of the sidebar to Tempt the Ocean (remember: PROMOTE YOUR BOOK wherever possible), and every new blog post shows up on both my Amazon author page (see below) and my Facebook author page (see below). Before publishing, I created an author page for Agnès de Savigny on Facebook. I can post directly to the Facebook page, as with my personal Facebook page, while followers (readers!) and other guests can post to a visitor’s tab. I can pin any post to the top of the feed, which I have done with the announcement of Tempt the Ocean‘s release (remember: make your book as EASY TO FIND as possible). The site includes a bio, and a link back to my WordPress blog as my “official” site. Through Facebook I created and shared my Tempt the Ocean launch event. All of my WordPress posts and Twitter tweets (see below) show up in my feed as well. Facebook has now added a Goodreads tab for those who have a Goodreads account (see below). I swore the attraction of the 140 character post would fizzle out. In a sense I was right, but my own determination to not be a party to it fizzled out, too. As Agnès de Savigny, I posted my first tweet this year, and unlike my nasty blogging habits, I continue to tweet almost daily. Twitter is a perfect avenue for following and conversing with other authors on the fly, as well as publicizing little moments to readers. My Twitter page features a mini bio and a link to my home page (for now, my author page on Amazon, where my book is listed). To boost my visibility, my Twitter feed appears on both my Facebook author page and my Amazon author page (see below). Goodreads, a popular site built for and fuelled by readers, has become an essential site for independent authors. The site provides a great place for authors to connect directly with readers, and to share ideas with other writers (via forums and groups). 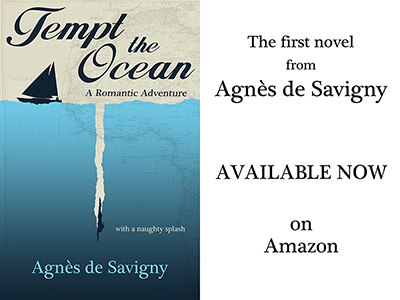 Only published authors are eligible to create an author page on Goodreads—and now that Tempt the Ocean has published, Agnès de Savigny is a Goodreads author. The Agnès de Savigny Goodreads author page includes a forum to respond to reader questions, a blog, a link to all editions of all my published book(s), and a link back to my WordPress site. My author photo remains a white silhouette for now. The unstifled howls of laughter from the boyfriend at seeing the photo I used on Amazon have inspired me to hold off until I acquire a better image of myself as Agnès. Goodreads also hosts a dedicated page for Tempt the Ocean, inviting Goodreads users to post their own ratings and reviews. Amazon, through which I chose to publish, offers a home page to each of its authors on each of its mothership sites (i.e. UK, US, Japan, Germany, etc). The author pages are not linked to each other, making it necessary to build a new page for each host site. I built an author page for Agnès de Savigny on both Amazon.com and Amazon UK. (The Canadian branch of Amazon does not host author pages.) Besides a bio, a link to Tempt the Ocean, and a forum for reader discussions, the American site includes the feed from my WordPress blog, plus my Twitter feed. Whew! That encompasses a lot of internet and social media flow, with the goal of picking up traffic at each site like a lumbering stage coach. Time will tell as to its success as a strategy. Sticking to online publicity alone is ill-advised all over. Authors, especially new ones, have to get out and meet people and do book signings and speaking engagements and book talks, etc to really build a following—a frightening prospect for those of us who suffer from stage fright and/or anxiety and/or depression. Ultimately any means of spreading the word is useful. Jane Friedman recently re-posted an interview with literary agent April Eberhardt that concludes with the above advice, noting that “authors carry copies of their books and show them to people.” What a novel idea. Next week: An excerpt from my current work-in-progress, the sweeping 18th century melodramatic epic Servitude. List in hand, I met up with an experienced self-published author named Eden Baylee whom a colleague had introduced me to. Eden has successfully self-published for several years now, and kindly sat with me over a pint to share her experiences. Her insights were both assuring and helpful. Frankly, it was great just to talk with another writer for an evening. I’ve finished half the work list at this point—something I am proud of. Formatting the manuscript for e-publishing was the first big step. I thought the formatting process would be easy. It was—but more time-consuming than I thought. I found lots of resources online about how to format a manuscript for electronic publishing. A couple of the most useful sites I referenced were Easy as Pie (which included a helpful post about cleaning up the original word file), and The Book Designer (which has many great self-publishing guides, including this one about how to plan the overall book). Not all of the sites I found covered every detail so I found it necessary to scour several resources/sites at once. To help with the other details outside of the core manuscript (dedication, copyright statement, title page—which I now understand compiles the “front matter” of a published book), I grabbed some well-loved books off my shelves as examples. I still need to add a table of contents specific to the e-book, and the book’s “back matter”—the author bio. The scrutiny paid off and I now have a polished, properly formatted manuscript ready to upload, including all my front and back matter. The next big steps are to design great cover art—not just good, but great—and to write a fun author’s bio for my romance pseudonym that I can post to a newly build Author’s Page on Facebook and on Amazon. I have scoured self-publishing resources and advice blogs in detail for the past few weeks. I sifted through the information and put together a kind of business plan. I wanted to know the balance between what money I could expect to spend vs. what sort of return I can hope for. I also needed to learn the minimum amount of my own money required to publish a first novel by myself. There are more ways than one to publish a book. Obviously, the bigger the scope, the more expensive the prospect. A straight upload to Kindle using Amazon’s own cover artwork can cost nothing. Going to print, even on demand, ups the cost (if one follows the most common piece of advice out there—hire a professional to tackle the cover work and layout). Several more articles suggested that any book worth buying must also have an audio book component. An audio book requires booking a recording studio for the time it takes to read one’s own manuscript without errors, then pay for the mixing and editing and final audio file formatting. I’m not going to attempt that. At least not at this moment. A print edition would be satisfying, but to do professionally does come at a cost. I broke down the costs for the minimum quality of print edition I would be willing to offer, and reached an amount of $1700. That’s not unreasonable, and I’d only need to sell 215 copies at $12 to make that back. But what if no one wanted to buy a print edition? I love the promise of holding a tangible printed softcover in my hands, breathing in that sweet smell of freshly printed ink on paper, and being able to say, “I wrote this!” But… I’m not willing to burn that money before I know I have a chance to earn it back. I’ve gone that route before with a short film I made. That film cost much more than $2000 and I never earned a cent of it back. So I’m a little gun-shy with investing in myself, however much I believe. I have determined that the best approach is to publish in phases, the way a real estate project unfolds. I have the means and the resources to publish electronically now. That puts the novel out there immediately and available for sale. I have to market the book (and myself) properly, but if I do it right and manage to achieve even limited book sales, I can put the proceeds towards phase 2: Print on Demand. If the book sales achieve dream phase, I will take the other piece of wise advice and put the money towards an audio-book edition. The conclusion: Approach everything professionally. You are the publisher, and you want to earn the respect of the book buying public on the same level that you want to earn the respect of the reader as an author. This means taking as much time as is necessary to polish what you are offering and how you are offering it. And expect the process to take some time.